Vintage Mix Stock has rich colors of shades of pink to magenta and white. They will reach a height of 20" tall and will grow up to 12" wide. Plant in full sun. 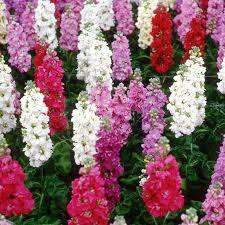 Vintage Mix Stock are have a sweet fragrance and make an excellent cut flower. Use as a Thriller in baskets or containers or do a mass planting in an annual flower bed.